Crystal Palace have promised to ban indefinitely any fans found guilty of throwing missiles at recent home matches. 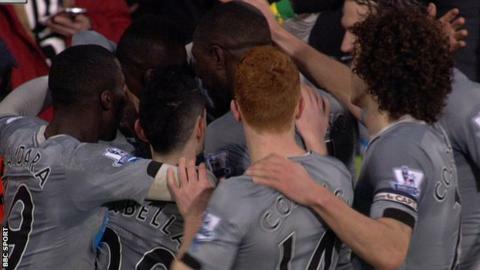 Newcastle captain Fabricio Coloccini was hit by a coin when celebrating his side's goal during a 1-1 draw at Selhurst Park on 11 February. United boss John Carver said the Argentinean "could have been blinded". An object was also thrown from the crowd during Saturday's 2-1 home defeat by Liverpool in the FA Cup fifth round. "We take a zero tolerance approach to this sort of behaviour and, if the perpetrators are identified, they will be banned indefinitely from the stadium," said a statement on the club's official website. "If they are season ticket holders their cards will be made void without a refund. "The stupid behaviour of a few supporters risks creating a negative image of our club and we would appreciate the help of Palace fans in identifying the culprits, who are not welcome at Selhurst Park."